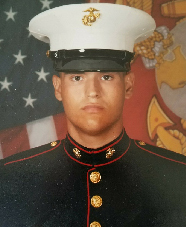 United States Marine Corps Private First Class Joshua Schroeder joined the military out of Nashville, Tennessee in 2008 because he wanted help make a change by serving his country. In 2010, while serving as a turret gunner in his vehicle in Afghanistan, Private First Class Schroeder's vehicle was struck by a more than 100-pound pressure plate. The impact of the blast immediately knocked him unconscious. He was transported by medevac to an area hospital, and then airlifted to Germany for further treatment before being sent back home. His injuries include chronic migraine syndrome, post-traumatic stress disorder, a traumatic brain injury, degenerative disc disease, arthritis in his back, shoulder and hip injuries, and hearing loss. For his service to his country, Private First Class Schroeder has been awarded the Purple Heart, Combat Action Ribbon, Afghanistan campaign Medal w/ 2 Bronze Stars, Sea Service Deployment Ribbon, Global War on Terrorism Service Medal, National Defense Service Medal, NATO Medal and the Presidential Unit Citation. Private First Class Schroeder and his wife Brianna received a mortgage-free home in Taylor, Michigan in June of 2017.